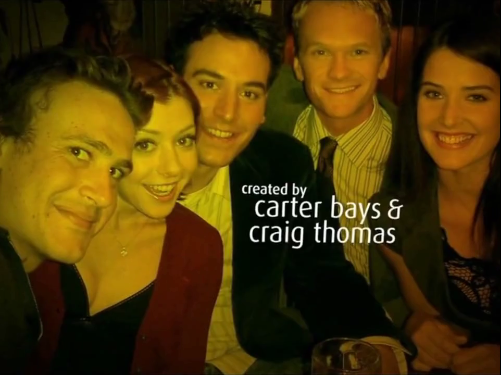 When How I Met Your Mother debuted back in the fall of 2005 it stood out for a few reasons. One of the major distinctions of the show was it’s most unique and utilized tool, the flashback and flash forward. It wasn’t a revolutionary idea by any means, but when you pair that with the fact that HIMYM was a multi-cam show that did not shoot in front of a live audience, it made the show a bit more unique. On the surface, that was the most distinct feature of the show, but not the most important. From the beginning, creators Craig Thomas and Carter Bays have written a show that, as silly and off the wall as it got at points, was always grounded in real ideas and life lessons. Of course there were over the top moments and relationships and ideals that were completely romanticized such as Ted’s grand romantic gestures in any of his relationships, or Robin’s Canadian back story or any of Barney’s tall tales, but as an audience member we’re willing to go along with all of it because the story is being narrated from the future and the assumption is, over time stories are embellished. Each story though, had a sense of realism and emotion to it behind all the gags, flashbacks and ridiculously funny antics. Some stories within HIMYM did it better than others, but most episodes or story arcs or seasons were able to bring their antics back down to earth and remind people that, at the heart of the story were people with real emotions who were just trying to navigate their way through life and find happiness and love. Though the finale had a lot of twists and turns and changed the character paths of growth and development for a few characters, (ultimately resulting in alienating a lot of fans and receiving a lot of backlash), it stayed true to it’s core by depicting real people with real life problems still navigating their way through life, trying to find love and let go of the past. The finale had a lot to cover and it did just that, perhaps more so than most would have predicted. The episode started off with a flash back to Robin first becoming a part of the group. This set the tone for the finale (technically listed as two episodes) as it jumped around in time from Barney and Robin’s wedding to the future group getting together periodically throughout the years leading up to Ted addressing his kids in the year 2030, the point where the first episode started with Bob Saget (as future Ted) recounting the story to his kids. Though this may have made it harder for the audience to really feel the impact of the emotional moments because it moved so rapidly and the context for some moments had to be inferred, it was completely necessary for the story they set out to tell in order to show a realistic development of the characters. Every character on HIMYM was completely different and it was wonderful to show how they all stayed true to their characters, some changed, some didn’t, but they all went through trials and tribulations that were grounded in real life. Barney and Robin ended their marriage after 3 years. Though this may feel like it completely undermined the last season (which took place entirely during the weekend of Barney and Robin’s wedding) it served a purpose. Barney was an over the top character from the beginning who, throughout the series, as hard as he would try, always seemed to revert back to his old self. These people exist in the real world. They are not necessarily bad people, they just simply are who they are and their friends still accept that. In a way, it was heartbreaking to see Barney revert back to his old self, but through the scene where Barney and Robin fought, it seemed that Barney tried to change as much as he could for Robin and she still wanted him to change more while she still focused on her career and dragging Barney around the world with her while she pursued her career. Robin is not the villain in this scenario by any means, but rather the problem with their marriage seemed to be lack of communication and compromise. It was hard to watch, but it also reminded the viewer that these are real people dealing with real problems and divorce is, unfortunately something that quite a few people will go through. The point is that bad things happen, but that doesn’t mean that you can’t move on in life and somehow find happiness and love, something that both Barney and Robin are able to do in different ways. Over the 9 years that we got to know the MacLaren’s gang, we saw them grow so close that that flashing forward once or twice and having them be a disconnected group would be disingenuous to the audience. It was necessary to show the slow steps, we needed to see different points in time over the years to show how they were slowly drifting and where they were going so that we could catch up to the present time of Ted telling his story in 2030. At times it was quite difficult to see Barney and Robin fight and grow apart because it destroyed the growth of both characters, particularly Barney. It was particularly rough to watch Robin walk away from the group because she felt she had passed on the one guy she should have ended up with, Ted, but at no point in time did it feel fake. As hard as it was to watch, it felt real. These were still genuine people going through rough patches in their lives, trying to figure everything out. The life lesson is that it never ends. There is no happy fairy tale ending where everyone gets married and starts a family because the reality of life is that there are all different types of people in the world who each have a unique path to take. That doesn’t mean that they can’t find happiness though, it just means that you may not always get what you think is right for you, because the ending that you think might be right for you, may not bring you happiness in the end. Barney and Robin did find happiness together as brief as it was during their short lived marriage, but the point is, what once brought you happiness may not always last. Sometimes you have to seek it out through other means and be open to new ideas. Barney reverted back to his old self because that’s who he’s always been at his core. You were lead to believe that he would remain this way, imagining him still womanizing in his final scenes on the show, but it was a surprising turn of events that turned his life around, he met the love of his life, his daughter Ellie. Though he never found happiness in marriage, (as far as we know, we never met the mother of his child, only referred to as “31”) he found all the happiness he needed in his daughter. The moment when Barney picked Ellie up for the first time, he shows pure unconditional love for his daughter in one of the more emotional scenes of either of the episodes. For a character who tried so hard to change for the woman that he loved, it still wasn’t enough because Barney was never meant to be married and settle down with a wife and yet he still found happiness. Through all of his growth, heartache and reverting back to his old self, it was fatherhood that side-blinded him and made him grow up. Becoming a father made perfect sense for Barney’s character arc as he had father abandonment issues and becoming a father would be the greatest challenge Barney could ever accept. Barney would want to give his daughter everything that he felt that he didn’t have, and the fact that he had a daughter speaks to his character growth even more as we see in a flash forward where he’s criticizing young women in their twenties for being out at a bar in skimpy clothing. No, Barney did not find happiness in a traditional fairy tale ending with a wife and white picket fence, but he is another type of person that exists in the world; a single dad who is still happy because his daughter brings him all the joy he needs in life. One of the major points of contention with a lot of HIMYM fans is the fact that the mother died. For a show titled, “How I Met Your Mother,” and a narrator guiding his kids and the audience through a tale of how he met the woman of his dreams, it almost seems like a cheat that the mother ended up dying. Cristin Milioti (who played Tracy McConnell, The Mother) did a wonderful job as the mother and her chemistry with Josh Radnor (Ted) was sublime. That’s part of what made it so difficult when Ted told his kids about how she became sick and had died 6 years earlier. Ted and Tracy were absolutely perfect for each other. After 9 years of watching the hopeless romantic try and find the love of his life, Ted finally found her standing at the train station with their umbrella. It was a perfect moment and a beautifully written scene that proved that destiny had weaved these two people together for a reason. The death of the mother shouldn’t undermine how perfect they were together. All season, it felt as if Cristin Milioti was underused in the series, but when it all came together in the end, it showed that her limited used had a purpose. In the final scenes of the show, we saw Ted tell his kids how his mother got sick, and had passed 6 years previously. To many people this was a punch to the gut, however, it’s where I found the beauty. The narration of the show takes place in 2030 and in the very first episode, Ted starts off telling his story from the year 2005. The entire show is based around storytelling and recalling some of Ted’s favorite memories. It’s obvious that these are some of Ted’s favorite memories leading up to meeting his wife but as we find out, his storytelling has a greater purpose that at the conclusion of the story, his kids pick up on very quickly. The kids stated it pretty clearly, that the reason they felt Ted was telling the story was essentially to ask their permission to ask Robin out on a date. It had been 6 years since the passing of his wife and the kids mother, and Ted wanted to give love a shot again. The reason this ending worked so well was because it stayed true to what the show was all along, a story about moving on and navigating your way through all the trials and tribulations of life and still finding happiness in the unlikeliest of places. The show masqueraded as something it wasn’t for 9 seasons, pretending to be, even in its title, the story a man, Ted, telling his kids how he met their mother. However, this is also the reason it upset a lot of fans. By Ted reverting and going back to Robin, it could be perceived that Ted loved Robin all along and she was the love of his life. However, the real takeaway from the show is that there isn’t necessarily 1 person out there for everyone. There are all types of people in the world, those who find love and are absolutely perfect for each other and hold onto it forever, Marshall and Lily; those who want love so badly that they change who they are only to find it doesn’t always work out, Barney; those who pass on love because they don’t feel it’s the right time, Robin; and those who wait for destiny only to have a few years of euphoric happiness with the love of their life, Ted. It seemed fairly obvious that Tracy was Ted’s love of his life at the time in his life when he found her. That’s not to say that he didn’t love Robin, but the message was that there’s not just 1 perfect person out there. Sometimes you meet someone who’s right for you but you grow apart or there are extenuating circumstances that keep you apart and it just doesn’t work out. At the end of our current, present day timeline, Robin’s wedding in 2014, Ted and Robin weren’t right for each other. Ted even has a speech to Robin while she’s getting cold feet about how they’re just not right for each other anymore. They had to find other people, grow in different ways and come back to each other. Ted had grown and moved on. Robin realized that where she was, who she was at that time, she loved Barney. This doesn’t undermine the love that Ted had for his wife, or the love that he had for Robin. It just meant that he was able to find and accept two different types of love and different stages in his life. Happiness is what you make it and people can try to be happy by realizing the wonderful things they have in their lives in the moment instead of holding onto memories of the past. Everyone in the world is different and just because love, marriage and a family works for some people and brings them happiness, doesn’t mean that it will for others. Those are facts of life as exemplified by the real people in everyone’s lives, whether they’re friends, family, neighbors or acquaintances. If you can keep moving on and don’t get stuck in the past, there’s always hope for a happy ending, it just may not be the fairy tale ending you hoped for. This entry was posted in Television on April 3, 2014 by Mo W.